DONATE YOUR WEDDING DRESS TO CHARITY! Did you just get married and unsure what to do with your wedding dress now that the big day is over? Consider donating it to charity, such as Brides for a Cause! So many brides are donating their wedding dresses right after their wedding! We are receiving more and more wedding dresses from weddings that take place within just a few weeks after the wedding. Brides today are being realistic with their wedding dresses after the big day. Women are not holding onto their wedding dresses like they once did. Partly because women are being more realistic about their wedding dresses. Many women are realizing their (soon-to-be) daughters (if they have daughters) won’t actually wear it. So why hold onto it? We LOVE getting emails from brides inquiring about donating their wedding dresses just weeks after their weddings. Receiving a bride’s dress right after the wedding, keeps our inventory current, allowing us to compete in the competitive bridal market. If you just got married and are staring at your wedding dress wondering what the heck you should do with it, one option is to donate it! Brides for a Cause would love to accept it! And to give you yet another reason….just think about what your wedding dress will actually mean for the next bride. You will be giving the next bride an opportunity to feel “that feeling” when they slip into your wedding dress, just like you did. Even though you won’t be there to witness it. It. Does. Happen. And being there is pretty incredible! 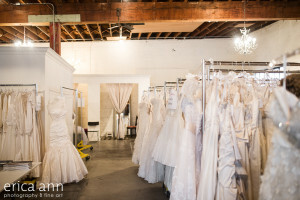 (photo: a look inside our bridal boutique. The back fitting room area is where all the moments happen). To learn more about donating your wedding dress, please email info@bridesforacause.com or visit our Donate page!